Lori Lieberman’s 17th CD… Mixed by Bob Clearmountain Lori first connected with the Netherlands years ago when she was on tour with Rick Nelson. Since then, audiences there embraced her music and supported her in her concert tours and CDs. Featured here, are some of the talented artists who came to LA to write with her: Ruben Hein, Niels Geusebroek, Jan Dulles and 3JS, Sandra van Nieuwland, and a new title, written with the legendary Henny Vrienten. Songs written with Wendy Waldman, the Refugees, and a duet with Shane Alexander make this CD, recorded in High Resolution 192/24, her finest recording yet. Each song, finely honed and more poignant than the next, reflects the songwriter who has seen it all but continues to learn, grow, and change. That stellar voice still exists, the variety, breadth and range of each song reminds one of a classic masterpiece. Musicians adding to their talents are: Lyle Workman, (Beck, Sting), Jason Orne (Alanis Morisette), Ryan MacMillan (Matchbox 20), Timothy Drury (The Eagles), and mastered at Wisseloord Studios, Netherlands, by Grammy Award winner, Darcy Proper. On Drive On Records Lori Lieberman's new CD available for pre-order Official release date - April 30th 2011. New European press, "Takes Courage" on V2 Records, a digitally re-mastered CD of the original "Gun Metal Sky" with an additional song by Dennis Wilson, including a special booklet of lyrics and photos, now available. 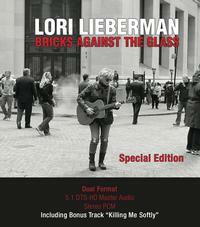 The CD Lori Lieberman fans have been asking for is here. This compilation, six years in the making, is a masterpiece of vivid colors, with songs that are both penned by Lieberman as well as five songs by some of our most beloved songwriters. Even in California, wreaths are nailed to the front doors and wither from the heat of the December sun - the malls are beginning their holiday panic, and joyful songs of Christmas taunt us to get into the holiday spirit. "It’s been five long years since “mission accomplished” and our sons, daughters, mothers and fathers are still being sent and re-sent to fight in this forever war. I thought about celebrating in the midst of much madness and it felt inauthentic to me - so I wrote down my wish, and my wish became my prayer, my prayer became my hope, and my hope became this Christmas song, entitled, “Daughters And Sons”." Lori's newest album on Drive On Records and possibly her finest, delivers 10 performances that will leave you breathless. The third CD from Pope Music - A departure from the two mic live recordings, this CD was Pope's first in-studio recording featuring Timothy Drury (The Eagles), Steve Klong, Lyle Workman... CD is currently out of print - CDR available. The definitive two mic live recording from Pope Music. Engineered by Gene Pope. Hailed by Rich Warren of WFMT as "Favorite CD of 1996." Included in this recording, "Girl Writing A Letter", "Circling Of The Souls." Lori's first collection of songs since the famous Capitol Years. This outstanding album was nominated for The Golden Note Award, a standard for recording excellence, marked the debut of Pope Music, was engineered by Gene Pope and produced by Mark Levinson. Featuring Amanda McBroom, Chuck Delmonico, Tommy Morgan, Dean Parkes. Lori’s first album, recorded in West Hollywood in 1972. Includes Lori’s original recording of “Killing Me Softly With His Song”. The songs on this album include, “Time For Me To Go”, “There’s A Harbor”, and “My Lover Do You Know”. Many new young talents lent their artistry to this recording: a very young Larry Carlton, Dean Parks, Max Bennet, Bud Shank, Dennis Budimir, John Guerin, and of course, Charles Fox, to name a few. This album was recorded in a very short period of time in 1974 at the studios at Capitol Records. Because Lori had been doing an extensive amount of touring both in the U.S. and overseas, her “road band” was featured, as well as studio musicians from her previous LP’s. Featured are: Sneaky Pete, Merry Clayton, and Herb Pederson. The song, “I Got A Name” was recorded as a tribute to Jim Croce. Songs included are: “A Piece Of Time”, “Stone Canyon”, and “Legacy”. Lori Lieberman’s second album for Capitol Records. It was recorded in 1973. It is one of her favorites, with beautifully developed and orchestrated songs. It includes: “The Seed First”, “It Didn’t Come Easy”, “Eleazar” and “I Go Along”, and “House Full Of Women.” Some of the featured musicians are: Dean Parks,Charles Fox, Dennis Budimir, John Guerin, Bud Shank and Tom Scott. This album was released only in Europe in 1976. It includes hits from “Lori Lieberman”, “A Piece Of Time”, and “Straw Colored Girl”. This album was recorded in New York in 1978, on Jimmy Ienner’s new label, “Millennium. Lori teamed up with Paul Leka, producer of Harry Chapin’s LPs, and all of the songs were arranged by Kenny Ascher. Highlights include “Burger King”, which details the story of a frustrated recording artist (guess who) who has to try out for a Burger King jingle. Other favorites include, “Boston”, “Late Last Night” and “Love Me Again”. Every purchase is final. LoriLieberman.com has a NO-REFUND policy. Please review the information below in the event of a problem with your order. If something is wrong with an order you placed with LoriLieberman.com, we certainly want to help you. Please read the information below for more on how to proceed. If you need to cancel or change an order that has not yet entered the shipping process. If you received a damaged or defective item. If you are missing an item. If you are wondering where your order is. Please keep in mind that LoriLieberman.com only offers replacements on orders that are damaged. Copyright © 2007 Drive On Records Inc. All Rights Reserved.